"A taste of the glitz and glamor." We already knew that Agent Carter would be moving to the West Coast in season 2, but now we have our first glimpse of what that will actually look like, courtesy of EW. 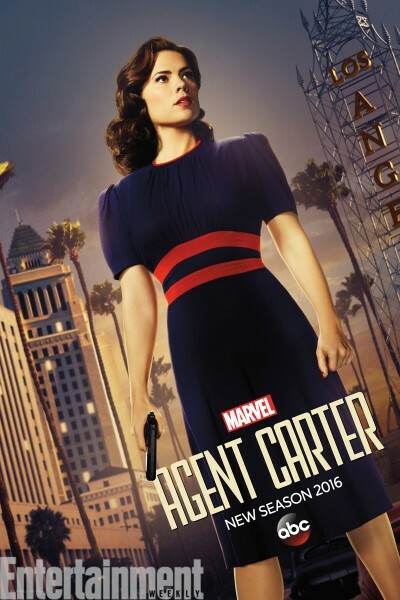 Based on comments by Agent Carter executive producer Tara Butters, EW wrote that “moving the setting across coasts provided the series with a whole new look,” a statement evidenced not only in the poster’s backdrop, but in Peggy Carter’s new attire. Explaining the reason for Agent Carter's change in scenery, executive producer Michele Fazekas said it will be the result of a “case that goes beyond what normal LAPD or normal local police would be able to handle,” forcing the SSR (and Peggy) to intervene. Edwin Jarvis (James D’Arcy), Daniel Sousa (Enver Gjokaj), and Jack Thompson (Chad Michael Murray) have also been confirmed to be part of the show in season 2. Attendees of next month’s New York Comic-Con will be able to grab a "little piece of old Hollywood" with a Agent Carter mini-poster at the Marvel booth (#1354) the entire weekend. And both Agent Carter and Agents of S.H.I.E.L.D. will be part of the “Marvel Television Presents: Agents of Primetime” panel at NYCC on Friday, Oct. 9 at 6 p.m. ET. Marvel’s Agent Carter is expected to return in January 2016. Featured image via SciFiNow.